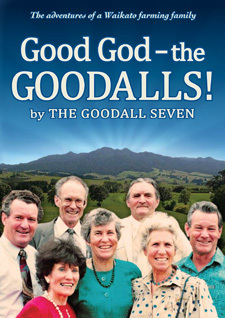 From the early 1930s to 1953, the seven Goodall children toiled away on a dairy farm near Frankton Junction in Hamilton, New Zealand. This remarkable volume records the stories of their childhood and their colourful adult lives. Good God: the Goodalls! is a fascinating insight into 20th century New Zealand life, containing the stories and adventures of a New Zealand family told with wit and charm. "I knew the Goodalls from way back... The bunch of them were the Magnificent Seven minus the horses... mischievous rascals who didn't just push the envelope, they blew it up!" "Good God: the Goodalls! is a compelling read... The Goodalls have delivered... They've written a gripping story of how they went from struggle to struggle, and from strength to strength."